(Nanowerk News) The use of graphene as an additive can give mechanical and electrical benefits to composite materials, making them multifunctional. In a novel fermentation method, Graphene Flagship researchers have developed graphene-containing rubber foams with unusual mechanical and electrical behaviours: when stretched, the composite foams expand and become more conductive. These unexpected properties could be promising for use in smart filters and medical devices. 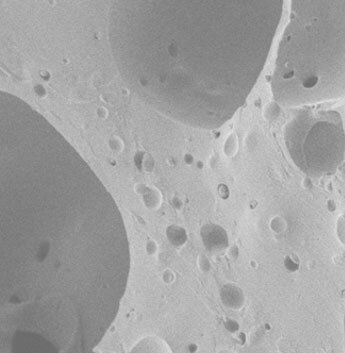 Inspired by natural foams, researchers have developed graphene-containing composite foams by fermenting with yeast. The process gives the multifunctional composites unusual electrical and mechanical properties. Published in the journal Advanced Functional Materials ("Graphene and Carbon Nanotube Auxetic Rubber Bionic Composites with Negative Variation of the Electrical Resistance and Comparison with Their Nonbionic Counterparts"), the research was performed by researchers at the University of Perugia, Italy and the University of Trento, Italy, in collaboration with Graphene Flagship partner Queen Mary University of London, UK. The graphene nanoplatelets used in the foams were produced by Graphene Flagship partner Nanesa, Italy. The researchers investigated three types of silicon rubber and carbon composites, using graphene nanoplatelets, carbon nanotubes, and a mixture of both. Inspired by the natural formation of porous structures, the unusual composite foams were created by fermentation using beer yeasts. Carbon dioxide bubbles produced by the yeast during fermentation are trapped in the rubber as it gels, producing a porous foam. This method is promising for scalable production of composite foams in a fast and sustainable manner. "Compared to other methods, the preparation of foams by yeast fermentation has significant advantages, such as a rapid pore formation, inexpensive reagents and tuneable hierarchical morphology of the pores," said Nicola Pugno (University of Trento and Queen Mary University of London), one of the authors of the paper. Typically, when an elastic material is stretched, it becomes longer in the stretched direction but thinner in the middle, like stretching a rubber band. Unusually, the graphene composites were found to expand widthways when stretched, due to the structure of the pores in the foam. The researchers showed that this so-called auxetic behaviour also made the composites more stretchable and damage resistant. The unusual properties of the foam are due to the shape of the pores. The researchers found that the bubbles in the graphene composites were deformed and buckled with collapsed walls. When stretched, the pores expand to an unbuckled shape, leading to the expansion in all directions. The researchers suggested that this expansion also causes the increase in conductivity of the graphene foam under stretching, by bringing more of the conductive graphene nanoplatelets into alignment. These effects were specific to the yeast-formed composite foams; the non-yeast composites did not show the auxetic behaviour or the decrease in resistance when stretched. "The increase of the electrical conductivity under stretching was most unexpected. Stretching such bionic auxetic composites foams could constitute an innovative approach to enhance their electrical and mechanical properties," added Pugno. The unexpected properties could be useful in a range of applications. Silicon rubber is often used in medical implants, due to its flexibility and biocompatibility. These their tuneable auxetic properties of these composite foams could find applications in medical devices, suggests Pugno. "These bionic composites could be used, for example, for manufacturing smart filters, so that when they are pulled their pores become larger. These could find application in drug delivery systems where the gradual release of the drug is controlled by the pulling force of the auxetic filter." "Researchers are always expected to use creativity and be inter-disciplinary, spanning in their work disciplines such as chemistry, material science, biology and physics," said Vincenzo Palermo, of CNR, Italy. Palermo is the leader of the Graphene Flagship's Polymer Composites Work Package. "This work merges together composites, graphene and the small organism which make beer; it is thus a very nice example of how Flagship scientists use imagination to create, day after day, new materials with original properties."